With the Cheltenham Festival now behind us all the focus now switches to the Randox Health Grand National 2019, run this year on Saturday April 6th. 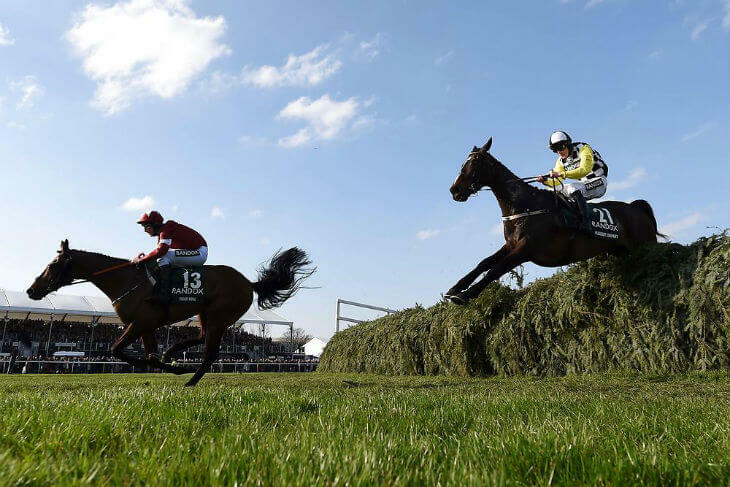 The latest Grand National Scratchings (Weds 20th March) saw the 100 runners reduced to 81, with one of the high-profile absentees being the recent Gold Cup sixth – Elegant Escape – who won’t run at Aintree after having a hard race at Cheltenham. After the Cheltenham Festival, it was last year’s winner – TIGER ROLL – that was the biggest mover in the 2019 ante-post Grand National betting market, as he came in from around 12/1* to as short as 5/1* after his smooth win in the Cross Country race at the Cheltenham. He’s rated 9lbs higher this year. Though, based on what we saw at Cheltenham will still be very popular in the Grand National betting in the build-up to the race, and could even be sent off as one of the shortest-priced Grand National favourites in recent times. There is a small word of caution though, as this owner – Ryanair boss, Michael O’Leary – has already voiced his concerns about his star staying chaser’s wellbeing and whether or not the horse needs to be put through another gruelling Grand National test. At this stage he’s still very much in the race and is likely to run. But if you are planning on having a bet on Tiger Roll it might pay to either have a ‘non-runner, no bet’ concession on your side – or wait till nearer the day. Having said that, the recent reports are that Tiger Roll has come out of that Cheltenham race very well though and unless his owner puts his foot down, his trainer – Gordon Elliott – feels the National will be his next target. “He’s a horse of a lifetime,” Elliott said. “He’s come out of Cheltenham very well and the plan is to go for the Aintree National. “Obviously I’ll have to discuss it with Eddie and Michael [O’Leary]. But he’s come out of Cheltenham very well so I can’t see any reason why he won’t be running there next. “That’d only leave him 1lb wrong on last year and it looks like he’s a different horse this year than he was last year,” Elliott added. Gold Cup sixth – Elegant Escape – is one of the big names to now bypass the 2019 Grand National with connections feeling he had a hard race at Cheltenham last time out. At just 7 years-old he’s still got time on his side, while the last horse aged 7 to win the National was in 1940 anyway! “He’s perfectly fine, he just had a hard race when sixth in the Gold Cup and with only a three-week gap we thought it best to leave him out. One horse we won’t be seeing at the 2019 Grand National is The Last Samuri, who was runner-up in the 2016 renewal. At the age of 11, the Harry Fry yard announced his retirement earlier this month, while the stables American has also been pulled from the race after another lack-lustre performance – this time in the Midlands National in the middle of March. The Paul Nicholls-trained Give Me A Copper is another high-profile name that’s been scratched from the 2019 Grand National after falling in the Ultima Chase at the Cheltenham Festival earlier this month. Their lightly-raced 9 year-old looks a fragile sort that has only had eight career runs and having failed to complete in two of his last four races then the tricky National fences might not be for him. One horse that has attracted a bit of interest in the last week is the recent Midlands Grand National winner – Potters Corner, who has come in from 66/1 into 33/1. This Christian Williams-trained 9 year-old got the better of a sustained battle with Ms Parfois in that recent Uttoxeter 4m2f race, so stamina certainly won’t be an issue. However, another word of caution is advised here as he’s currently number 94 on the list so will need a lot of horses ahead of him to come out between now and April 6th. Don’t forget, only 40 horses will run. Therefore, unless you are backing him with a ‘non, runner, no-bet’ offer it will be better to wait to see if he gets into the race. Since the Cheltenham Gold Cup was run earlier this month we’ve also seen a few horses that ran well in that race supported in recent days. Elegant Escape, who won the Welsh National back in December, was a gallant sixth in the Gold Cup at Cheltenham and many feel the longer trip will be more to his liking. However, he does have a huge trend to overcome – at just 7 year-olds old he’ll be looking to become the first horse of that age to win since 1940! Anibale Fly is the other Gold Cup horse that’s attracted support in the 2019 Grand National betting market – coming in from 25/1 to around 12/1, and many of the bookmaker’s second favourite. This 9 year-old is the second-highest rated runner in the field (164) and punters might recall him finishing fourth in the race last year. He was only beaten 11 ½ lengths last year. But will have a 4lb weight pull with Tiger Roll this time. The way he finished in the Gold Cup to take second suggests he’s crying out for another crack at this longer trip and with the experience of tackling the tricky Grand National fences last season, then it’s easy to see why punters are also latching onto him in the 2019 Grand National betting market.